Baby Blend makes organic cotton “Tee Shirts for the Daily Grind”! Peace on a shirt never goes out of style. 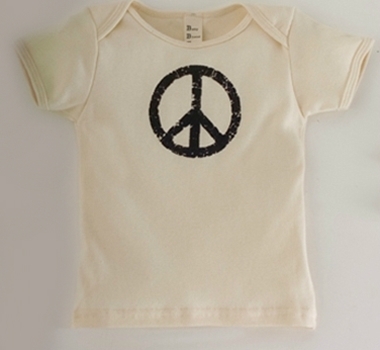 Baby Blends “Vintage Peace” is the coolest shirt for every season. Each shirt combines laughter, love, and comfort. Baby Blend Tees are made of sweat-shop free, 100% organic cotton. They are soft and durable and unbelievably adorable! Each shirt comes packaged in its own coffee bag and makes an ideal gift. Childrens size Baby Blend tee shirts have a crew neck, baby size Baby Blend tee shirts have baby shoulder flaps. Made in the USA of 100% organic cotton with water-based inks.